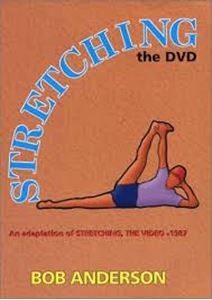 STRETCHING, THE DVD features Bob Anderson and offers people daily stretching with a simple, safe format. The 57 minute DVD, being a DVD, is easy to navigate and is organized into six comfortably paced sections: a brief introduction, stretches for the neck and back, then legs and hips, followed by stretches for the feet and then arms and shoulders. The DVD concludes with a 14 minute overall series of stretches that can be followed for everyday fitness or for a specific sport or activity. A special feature is that it is in both spoken English and Spanish. STRETCHING, THE DVD is appropriate for people of all ages and interests. SHIPPING - Regardless of the shipping method choice recorded on your online order, we usually ship one DVD via USPS FIRST CLASS MAIL to a USA address and charge your credit card $3.75 for shipping (NOT AS QUOTED ON INVOICE.) If you have a reason for choosing a method of shipping other than USPS First Class Mail, please enter your preference in the COMMENT section of the ordering process. ***Order both the STRETCHING book (spiral bound) and the STRETCHING DVD for $32.95 (normally $19.95 + $17.95 = $37.90 = $4.95 SAVINGS). *** Receive discount when book and DVD are in your shopping cart. The spiral bound edition of STRETCHING is not available in bookstores.